Bombay Cafe Boca features distinctive regional Indian cuisine – from savory street food and breads to tantalizing vegetable specialties and fragrant curries, to signature tandoor-grilled meats and seafood. Designed for comfort, relaxation and the enjoyment of food, drinks and conversation, our dining room and bar/lounge reflect modern India with a nod to cultural traditions and motifs. 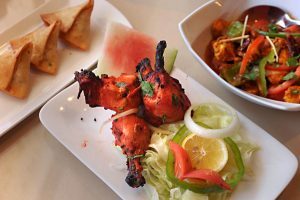 Everything such as the popular Tandoori Chicken to vegetable favorites such as Paneer Tikka are made with the freshest ingredients and grilled to perfection. 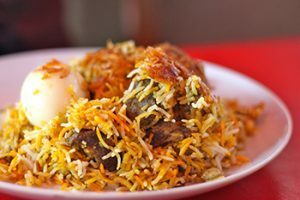 We offer Flavorful Indian Cuisine in a cozy atmosphere while serving delicacies of royal kitchen of India, including our delicious signature Biryani with Lamb/Shrimp/Veg. 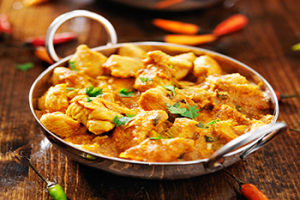 We offer authentic Indian curries, as fresh and as hot as if you were in India itself. For all our curries we pride ourselves in using authentic Indian herbs and spices, imported straight from India. Bombay Cafe !!! !awesome food and experience. Welcome to Boca. Great buffet and wonderful service! Buffet was very reasonably priced! Wonderful, modern indian cuisine here in boca. Highly recommend!!! Recently opened new location in Boca Raton so I went to try it out and their food was excellent! Buffet fully stocked with all kinds of Indian goodies. Come and taste it all. Highly recommend. The is food is simply delicious! I love the new location. Went for lunch and the buffet was great, so many choices and all were so good. A must Visit place for non Indians to check out the delicacies of Indian food and for Indians to Get a refreshing taste .Its a Place where you will feel like home away from home .In Matter Of Service i would rate it 5 on 5 Loved the overall experience . The service was excellent and they have some of the best Indian food in south FL. The prices are fair as well. A+ Experience. Tried it first time today - excellent food and very good service. Lovely Hostess, very helpful, I walked in through the door and was greeted by a very warm smile, she introduced me and my friends to new and exciting foods! 10/10! Ate there for the first time. The buffet was very tasty, a lot of dishes to choose from. Definitely the best in Boca. The Restaurant is immaculate and the staff is friendly. We've been driving once a week down to Fort Lauderdale to eat our favorite food since we moved to Boca. We are thrilled that they have opened a location here! Our curry is consistently full of delicious flavor. I highly recommend the lamb korma. The chicken tikka was absolutely amazing! The staff was very attentive, friendly, and professional. Would highly recommend to anyone looking for great Indian in Boca! Love this place! After trying it when it first opened I passed along how much I enjoyed it to my coworkers, now the entire office has become obsessed with it as well. Great food! Highly recommended! Same as the other guy. Was a regular at the old location. New location is much more restaurant style (as opposed to cafeteria). If you're not into spicy, be aware, the default level is higher here. To me, that's a good thing! Bombay Cafe Boca showcases the finest in Indian cuisine, complimented by an exceptional dining experience built on careful attention to every aspect of service, food, atmosphere and wine selection. Celebrate any special occasion by having our chef and team create memorable catering dishes for your next holiday gala, anniversary, shower, office luncheon or private at-home dining. Our buffet set up offers a fine selection of your favorite traditional Indian dishes. Feel the need to enjoy our delicious menu in the comfort of your own home? Now you can get the same amazing varieties for carryout or delivery by Delivery Dudes. Delicious, creative and authentic food is our commitment to society. We at Bombay Cafe Boca try to make each dish a distinctive, refined preparation. Our food is representative of many varied regional cuisines of India and the many ethnic groups of people in the subcontinent. Visit us today for Dinner or the Best Lunch Buffet in Boca Raton, Florida. Join our e-mail list to receive special discounts and the latest updates.